Make this colorful Necklace with only one skill set, wire wrapping. 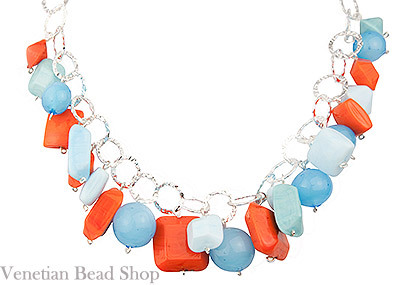 It is in the Pantone colors for summer and will wear well into the fall with the combinations of tones of aqua and orange worked around our Premium Chain from Italy. Each link of this Italian chain is soldered closed so you never have to worry about your wirewraps falling through. Make it your own by changing colors, and you can lengthen or shorten to your needs. Cut your chain for the length you want. If you need longer than 16” then cut to the length where you want it to hang. With the left over of the chain, you can make earrings to match the necklace. Find the center of your chain and wire wrap the 14mm Aqua Caramella Round and then work to each side. You will wire wrap one bead in each of the chain loops On one side of your center bead, wire wrap a 10mm Celeste Aqua and on the other side add the square beveled Aqua. Followed by the orange 16mm beads on each side. Follow the pattern. You can move the beads around as the necklace is asymmetrical, it won’t make a lot of difference.